Like a delicious part of a nutritious breakfast, inspirational music can fuel our creativity and help us power through the tedium that often prevents us from enjoying increased productivity. Of all the music I’ve enjoyed over the years, Ozric Tentacles consistently produce some of my favorite. Arising from England’s festival scene in the early 1980s, Ozric Tentacles has produced a huge body of work. Their particular flavor of psychedelic space rock makes liberal use of unconventional time signatures, Eastern scales, progressive grooves, and electronic soundscapes. These elements blend together to create rich musical journeys, often meandering through the mind to end in places different from where they began. One thing I’ve always appreciated about their music is that its complex enough that, when I listen closely to songs I’ve heard many times before, I sometimes discover new things–yet it’s easy to put in the background when I need to focus my attention on writing, math homework, or whatever and it doesn’t disrupt my concentration. 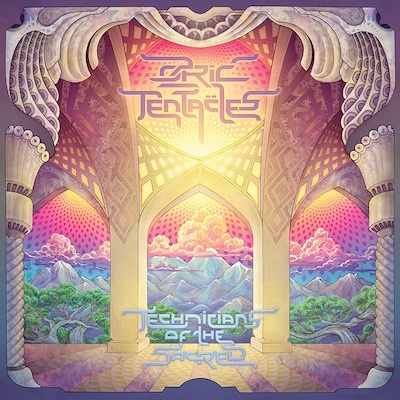 This week saw the U.S. release of their new album, Technicians of the Sacred. I’m still assimilating it, but I already think it’s my favorite release since 1999’s Waterfall Cities. As a double-length album with a surprising lack of filler material, there’s plenty of cool music to absorb. What music feeds your muse and empowers your creativity? This entry was posted in Influences, Our Creative World and tagged author, fiction, mike schulenberg, music, music for the muse, ozric tentacles, space rock, technicians of the sacred, writer, zenlike creature on May 29, 2015 by Mike Schulenberg.